How does the Wind Effect Your Golf Shots? Even though Poole is blessed with more than its fair share of sunny weather compared to many areas of the British Isles, because it is located by the coast, the courses in the area are sometimes exposed to what many golfers would describe as particularly windy conditions. For the uninitiated these can be particularly difficult to handle so here are a few facts and tips that can help you handle the wind. The following table shows you how much a headwind or tailwind can affect your carry distance. I have used an amateur golfer who swings a 6 iron at 80 mph in this example which normally leads him to carrying the ball 153 yards when there is no wind. As you can see, a headwind hurts more than a tailwind helps. It is worth noting that headwinds and tail winds also affect the height and land angle of a golf shot. When hitting into a headwind shots will fly higher and land steeper and a tailwind produces shots that fly lower and land flatter. Contrary to popular belief, the wind does not have an effect on the spin rate of the golf shot but into a head wind, spin is the enemy as it increases lift and drag. Swinging harder creates more club head speed which creates more spin. To counter this you should use a club with less loft as this will reduce the spin loft and therefore the spin rate. If you want to take maximum advantage of a tail wind, make sure you use a club that enables you to launch the ball higher as otherwise the ball will fall to the ground too soon. 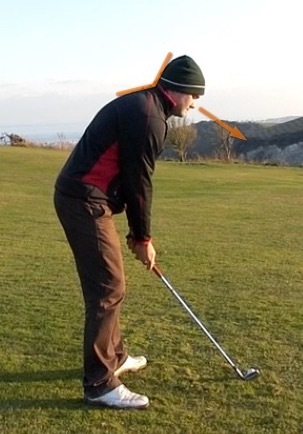 Headwind Driver Tip: You may have heard of high launch and low spin to maximise distance? Theoretically, when hitting a driver into a headwind you will still benefit from doing this unless the wind speed is above 30mph. However, the longer the ball is in the air the more the ball can be affected by the wind. This means that if you sometimes have difficulties hitting the ball down the middle you may benefit from launching the ball lower and relying on more roll to get the ball to travel the expected distance. The following table shows you how far offline the ball will travel when hitting into crosswinds. 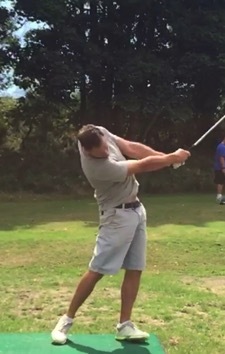 Again I have used an amateur golfer who is swinging a 6 iron at 80 miles per hour. As you can see, a 20 mph crosswind will send a straight shot 81 feet to the side, that is a full 27 yards to the side! Make sure you are aware of this so you can sufficiently allow for it when you are next on the course. Many people are often shocked when they find out quite how much the wind can affect a golf shot, make sure you don’t let it surprise you. Back Straight and Chin Up? 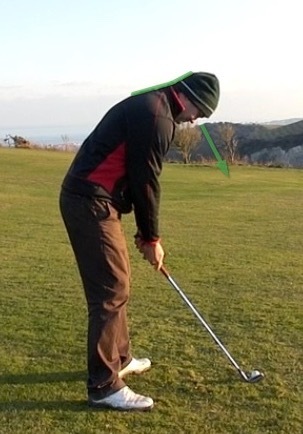 Is is often said golfers should setup with a straight back and neck. Two reasons often given for this are that it is athletic and allows room for the lead shoulder to turn under the chin during the backswing. Your torso should be flexed forwards towards the ground but the back should not be straight. While the spine should be relatively straight at the bottom it should flex forwards progressively more as you reach the top. This will tilt your head downward so you are able to see the ball without straining to see it by looking out of the bottom of your eyes. The benefit of seeing the ball in this way, through your central vision, is that your brain will be able to process the image in more detail. If the eyes keep having to relocate the ball this leads to difficulties perceiving depth and thus makes it hard for the brain to compute where the ball is. The result of this are all kinds of compensations made on the fly, not the best way to play an already difficult game. This curvature of the upper spine will also make it much easier for you to turn your shoulders in a circle without losing your inclination to the ground as the lead shoulder will be in position to travel downwards and back rather than just back, thus nullifying the room to turn the shoulder under the chin hypothesis. I would encourage you to find videos on YouTube of some of the greats such as Sam Snead, Jack Nicklaus or Arnold Palmer and you will see they all exhibit these traits. This is an often used refrain that carries a lot of truth. Even though impact with the golf ball lasts only 1/2000 of a second, it will determine in large part what happens to your shot. The club’s direction of travel, where the face points and the speed at which the club travels are all important, but none more so than where on the club face you make contact. When the strike point is off centre then all bets are off. Did you know that if you strike the ball towards the heel of the club this causes the ball to fade or draw less and if you hit the ball towards the toe of the club it causes the ball to draw or fade less? This is especially the case with the driver and is why they are not built with a flat surface. 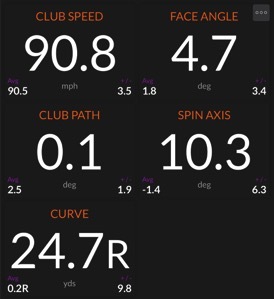 Did you know that if you hit the ball towards the bottom of your driver face then your ball speed will go down by almost as much as 10 miles per hour and the spin rate will increase by almost 800rpm? All this is caused by a phenomenon called gear effect and it happens on virtually every single golf shot that is hit. This is because even the best golfers miss the sweet spot more often than they find it. With that being said, it is also true that most golfers tend to have a specific pattern of where they hit the ball on the club face. If you would like to find out where your contact point is I recommend you bring to the course a bottle of dry shampoo or any spray that doesn’t leave a permanent mark, spray it on your club face, hit some shots and see where the marks are left. If you create an awareness of what your strike pattern is you will then be able to embark on the journey towards improving it. 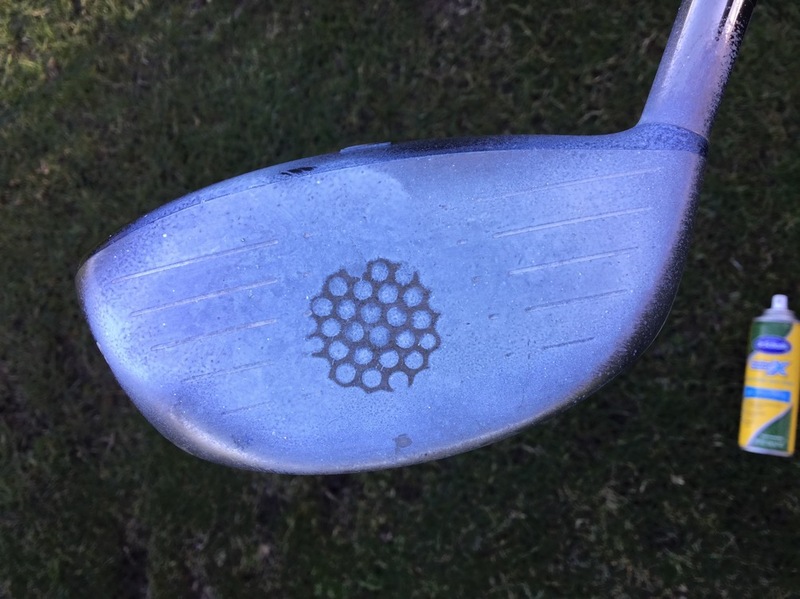 Remember, if you are after more distance, it is more important to learn to hit the ball on the middle of the club face than it is to learn to swing the club faster. Note of Caution: For those of you who have access to a Trackman when you practice, quality of strike is sometimes correlated to the Smash Factor number. Please be aware that there are instances when you cannot reach the elusive 1.5 smash factor number with a driver even with a perfect strike. This would happen, for example, when you hit down on the driver and your spin loft needs to be high enough for the ball to stay in the air longer. Can you make an educated guess? In which of these two pictures did the golfer play a draw? These two shots are taken from a recent golf lesson where the pupil was struggling to hit draws and instead hitting shots that started and curved too far to the right. You can see the numbers for the two shots below, a 25 yard deflected slice on the left and an 8 yard push-draw on the right. 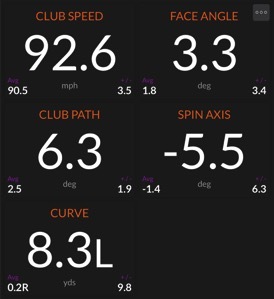 If you know what to look for and upgrade your swing in the right areas, your ball flight, trackman numbers and scores on the course can change dramatically in a very short amount of time. Are you tired and frustrated of not being able to hit the ball solidly when it rests on the ground? Are you unable to take a divot and when you do take one it happens to be the big ball (earth) before the little one? Learning to hit the ball before the ground and learning to hit the same spot on the ground every time with your club are invaluable skills if you wish to bring your handicap down. Thankfully, there is a simple observation that can help you in this regard. When measuring how the best players move it is noticeable they move their hips towards the target at impact more compared to the less skilled golfers who have their hips further back. What does this mean for you? It means that if you tend to hit fat shots, there is a good chance you can work on this by having your hips more forwards (towards the target) as you hit the ball. 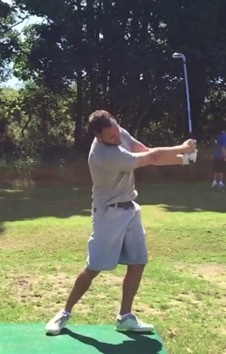 Expert Golfer Demonstration: Notice the hips slide progressively more towards the target throughout the swing.